New York, NY: In an interesting thematic confluence of New York productions, there are three shows concurrently running that focus biographically on the lives of three music legends. On my Spring New York stopover I saw Satchmo at the Waldorf, a drama about the late great jazz trumpeter and singer, Louis Armstrong set at the time of his final performances at the Waldorf Hotel in New York. On this trip, I have just seen Beautiful: The Carole King Musical, that traces the evolution of the musical career of King, still a vibrant and active singer, pianist and prolific songwriter who has written more than 400 songs. 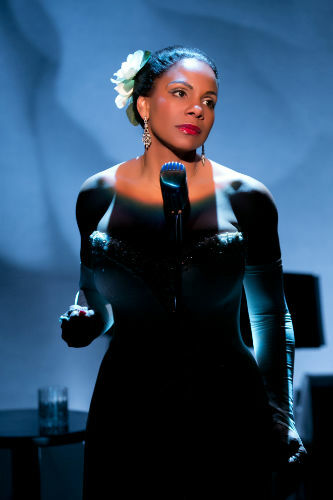 Continuing the music theme of my theater picks for New York 2014, Lady Day at Emerson's Bar and Grill stars the luminous Audra McDonald as tragic jazz great Billie Holliday, who died of cirrhosis at the too-young age of 44 . NIcknamed Lady Day by tenor saxophonist Lester Young, Holliday overcame a difficult start in life to become a jazz inovator and famous singer, only to succumb to the complications of her drug and alcohol addiction. Setting the scene realistically as a bar, there were tables placed on the floor adjacent to the stage. Some audience members were seated there. As in many clubs, the tables were packed very close together and although one would obviously get more of the sense of actually being in Emerson’s Bar I was pleased that I had instead opted for regular seating. We had very good seats with perfect sight lines, and so close to the stage that every subtle facial nuance was evident. 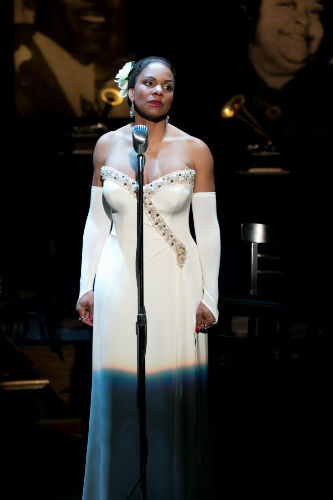 Almost ten years ago I read Lanie Robertson’s Lady Day script in a seminar course on modern theatre. At the time I found it difficult to study and really did not empathize with the sadness of her state. When I realized that I would have the opportunity to visualize the character of Holliday brought to life on stage, I was excited to see it. From the second McDonald entered slightly off kilter looking not quite present yet with a wistfully hopeful smile, it was fascinating to see how one could see this beautiful woman yet perceive her as a the sadly ageing, inebriated Lady Day. As Holliday rambled, often confused through her reminiscences with the watchful Jimmy Powers (Shelton Becton) constantly drawing her back to her singing gig, it was the moments when that hopeful smile broke through the confusion that made me want to cry for her. Altogether McDonald gave a very moving performance, and overall this is a show well worth seeing. New York Stopover Spring 2014: Theatre and Dining. New York, New York 2009 – Seven Days of Theatre, Food and Dance: PART I. New York, New York 2009 – Seven Days of Theatre, Food and Dance: PART II.